> If people intend to make prudent and sustainable use of natural resources, they must determine in what manner and to what extent they wish to utilize the natural world or conserve it. This is only possible if they can make an accurate assessment of the costs and benefits. 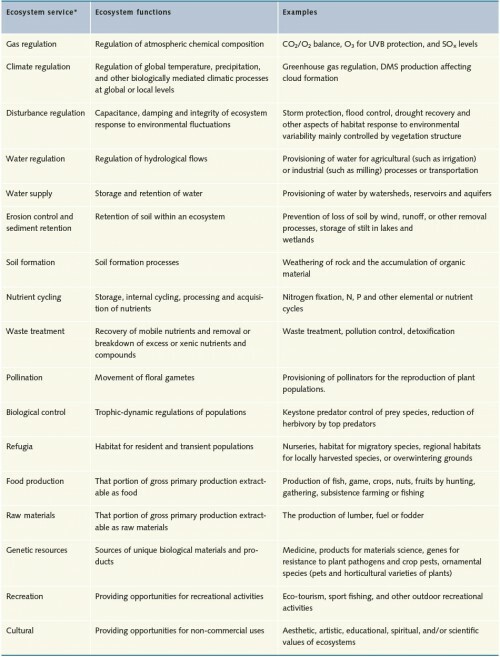 It can be helpful in this context to look at nature in economic terms as natural capital. Nevertheless, it is highly problematic to put a value on the services of nature. For time immemorial nature has been providing human beings with the resources they need for survival; things like fruits, grains, fish, meat or wood. It also puts a free supply of clean air and clean water at our disposal. Economists group all these aspects together under the heading of natural capital. In simplified terms, natural capital is defined as the stock of natural assets such as the soil, forest or ocean, which generate natural products and services such as fresh air or potable water. 1.10 > One of the first blast furnaces, in Coalbrookdale, England, in the year 1801. 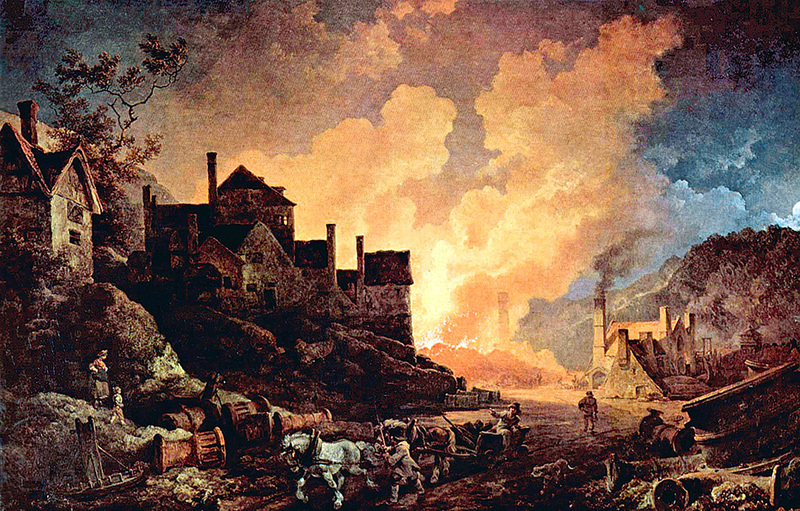 During the Industrial Revolution a paradigm shift took place in economics. Many experts lost sight of the significance of soil and the services of nature as economic factors. Only the investment of real capital was thought to determine economic growth. Measured against the several-centuries-old history of economics, the concept of natural capital is still very new. It was only coined in the second half of the 19th century. Until then, economists took nature and its services for granted. The sole exception was fertile agricul­tural soil. Before the invention of artificial fertilizers, the fertility of soils and hence their yield was limited. The ­productivity of farmland could not be increased at will because the quantity of nutrients was limited. Since adequate food had to be produced for the population nevertheless, large areas of land had to be farmed, and the number of people working in agriculture was very high. After the German chemist Justus Liebig had invented ­artificial fertilizer in the mid-19th century, the situation changed. The productivity of farmland was increa­sed several times over. Fewer farmers could harvest more crops. This released workers who were needed in the ­factories of the growing industrial towns. The importance of soil as an economic factor diminished. Instead, many economists came to consider real capital, in the form of machinery and infrastructure, as the only factor determining economic growth. Very few thinkers gave more sophisticated consideration to nature and its services. Among them was the English philosopher and economist John Stuart Mill, who emphasized in the 1870s that nature ought also to be preserved for the sake of its intrinsic charm. Mill wanted to halt population growth. He feared that humankind would continue to destroy near-natural, aesthetic landscapes if the human population continued to expand. 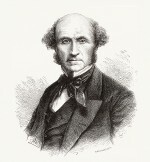 1.11 > The English philosopher and economist John Stuart Mill noted in the 1870s that nature would suffer further destruction unless population growth was halted. At this time more concrete work was being done by the French economist Léon Walras, who published his Elements of Pure Economics, or the Theory of Social Wealth in 1874. Among other issues, he deals at length with the services of nature in his work, and develops the concept of natural capital. Walras, too, initially considers nature as an inexhaustible source because in his view natural capital cannot be destroyed entirely. On the contrary, he says, year after year it keeps supplying new ­products. 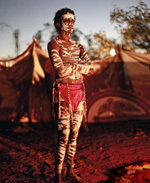 Walras refers to this fertility of nature as a service, and to the yields that agriculture produces as “rents”. However, Walras recognizes that natural capital, like other forms of capital, can become scarce and that its value rises as a result: “the quantity of land can be very limited in an advanced society, relatively to the number of persons […] and has a high degree of scarcity and value”. Walras makes further distinctions and writes that natural capital can be used in two ways: firstly, as existing capital stock from which long-term income is generated – for example, an apple tree that provides fruit for many years – and secondly, as capital that is used directly – for example if someone cuts down the tree and sells the wood. Walras’s approach was extraordinarily modern in its analytical breakdown of the concept of natural capital. Even today, experts still make a similar distinction between stock and flow ­variables – in other words, between natural capital that ­ is used and consumed directly, and natural capital that provides a continuous flow of rents over a longer period of time. Despite Walras’s publications, natural capital played no part in economic theory for around another 100 years because economists were convinced that there could be no absolute scarcity of natural capital. Is the value of nature measurable? Today the concept of natural capital is well established. Even so, how the value of nature should actually be estimated is still a contentious issue. This question is important when it comes to quantifying the losses caused by progressive degradation of nature or assessing whether it is economically viable to invest in natural capital. Investment projects of this kind may include the restoration of degraded natural landscapes to a more natural state, or the near-natural management of forests. The valuation or monetization of natural capital is a huge challenge, par­ticularly because natural capital does not take just one but many different forms – forests, rivers, meadows or the ocean. And all of them provide different services. 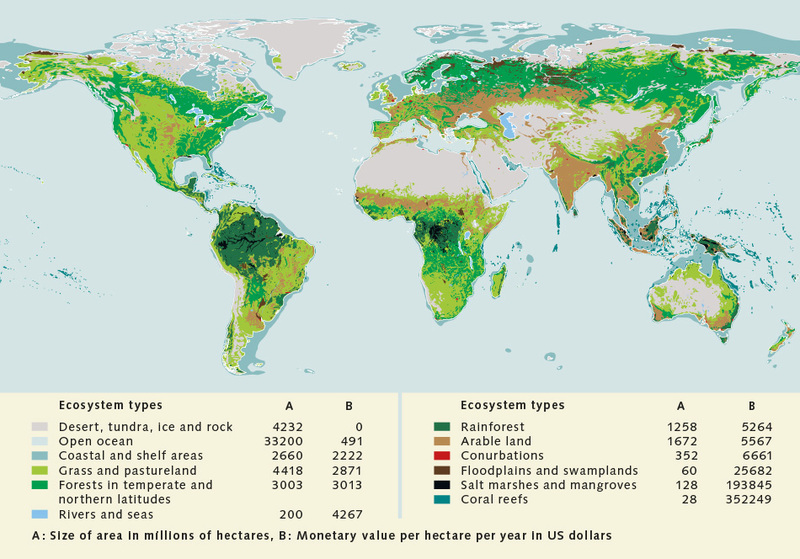 1.12 > World map with the different ecosystem types and the calculated values of their ecosystem services (in US dollars per hectare per year). Ecosystem service Economists and sustainability theorists call any service that nature provides an “ecosystem service”. Examples are the availability of potable water, fresh air, or food in the form of fish and fruits. Added to these are aspects which are not directly measurable like the beauty of a landscape that provides people with recreation. “Natural capital”, in turn, denotes the natural resources which produce all these ecosystem services. In 1997 a team of American scientists and economists published a study in which they attempted to document the total value of services provided by all ecosystems worldwide. They came to the conclusion that globalnatural capital including these various ecosystem services generates 33 thousand billion US dollars per year – almost twice as much as global gross national income which amounts to 18 thousand billion US dollars. In this study, the oceans accounted for the lion’s share, valued at 21 thousand billion US dollars. For their study the scientists had divided the globe into around 20 ecosystem types and seventeen eco­system services, such as climate regulation, water storage or food production. Subsequently, for every ecosystem and every service they determined the value of one hectare and then calculated projections for the total global area. 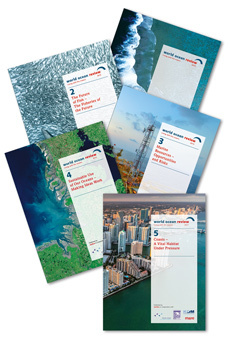 In 2011 a new study was presented in which the data from 1997 was re-evaluated and the ecosystem services updated. One of the most important findings of this study was that because of land-use changes, the value of ecosystem services had fallen from 1997 to 2011 by at least an average of 4.34 thousand billion US dollars per year. Land-use changes are processes like the conversion of tropical rainforests and wetland areas into productive agricultural land. 1.13 > In order to assess the total value of services provided by all ecosystems worldwide, in 1997 US researchers defined various ecosystem service categories. Although the study was criticized because it massively simplified the worldwide situation, it was nevertheless a mile­stone because it made clear the vast overall economic significance of ecosystem services in their entirety. * We include ecosystem “goods” along with ecosystem services. Roadmap towards a sustainable future?